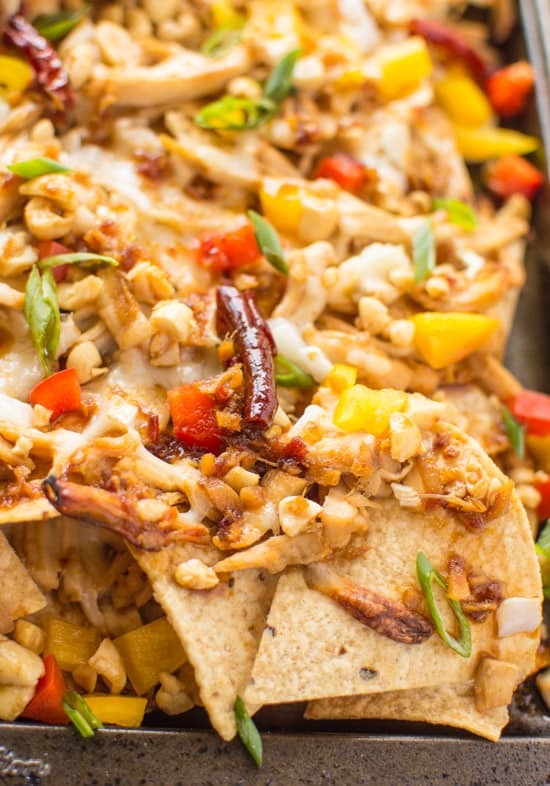 Crisp, cheesy nachos loaded with the sweet and tangy flavors of kung pao chicken and peanuts. Nachos will never be the same for you again! The first time I ever had kung pao chicken was when I was studying in China six years ago. I know, how is it possible that it took me that long? Here’s the truth. When it comes to eating out at a Chinese restaurant, my family can get a bit particular. Mama Lin’s famous line is: “Why order this when I can easily make this at home?” Based on that logic, nearly half the menu is usually off-limits. With horror and shame, I recently found out that I say that line at restaurant, too. But that’s besides the point. As you can imagine, kung pao chicken, a dish with just chicken pieces, chilis, peanuts, and sauce, never made it onto our dinner plate when we ate out. Of course, when Mama Lin says, “it’s so easy, I can make it at home,” it actually means “it’s so easy, why make it at home?” That’s just typical of mothers, isn’t it? When I finally tasted kung pao chicken in Nanjing, I was hooked immediately. That sugar and spicy sauce mixed with freshly toasted peanuts is an addictive combination. It’s just one of those dishes that even a hole-in-the-wall restaurant couldn’t mess up. Thank goodness for that. Kung pao chicken got me through so many lunches and dinners in China that I have a fondness for them now. My love runs so deep that I decided to add them to my nachos. Wait…are we actually doing this? Kung pao chicken…on chips…with cheese? I can sense your hesitation, but believe me, it works! If barbeque nachos can be a thing, why not this? It’s the perfect marriage of two delicious dishes. Shred the cooked chicken breast. Give it several rough chops if you think the pieces are too big. Prepare the sauce. Mix the cornstarch with 1 tablespoon of water and set aside. Heat the canola oil in a saucepan over medium-high heat. Place the chopped garlic and ginger in the oil. When the garlic starts to brown, add the rest of the water, soy sauce, sugar, chiles, and wine. When the sauce starts boiling, add the cornstarch mixture and reduce the heat to medium-low. Let the sauce simmer for about 3 minutes, or until the sauce starts to thicken. Place shredded chicken in a small bowl, and stir in half the sauce. In another small bowl, stir the chopped peanuts with just enough sauce to coat the peanuts (about a tablespoon). Set everything aside for about 10 minutes. Start building the nachos. Spread half the chips on the baking sheet. Spread half of the chicken on top. Layer with half of the onions, pepper, and cheese. Drizzle two tablespoons of sauce over this layer. Add another layer of chips on top, then chicken, onions, and cheese. Bake for about 20 minutes, or until the cheese is melted. Top the nachos with the remaining pepper, green onions, and peanuts. Drizzle any leftover sauce over all the nachos. Best served immediately! 1. Shaoxing wine adds a slightly malty flavor to the sauce. Feel free to leave it out if you don’t have it on hand.[br][br]2. If you’re starting with raw chicken breasts, bake them at 425 degrees F (220 degrees C) for about 18 to 22 minutes, or until the chicken reaches 165 degrees F (75 degrees C).[br][br]3. Feel free to add more cheese if you’re looking for cheesier nachos. LOVE this idea!!! And now I’m hungry. 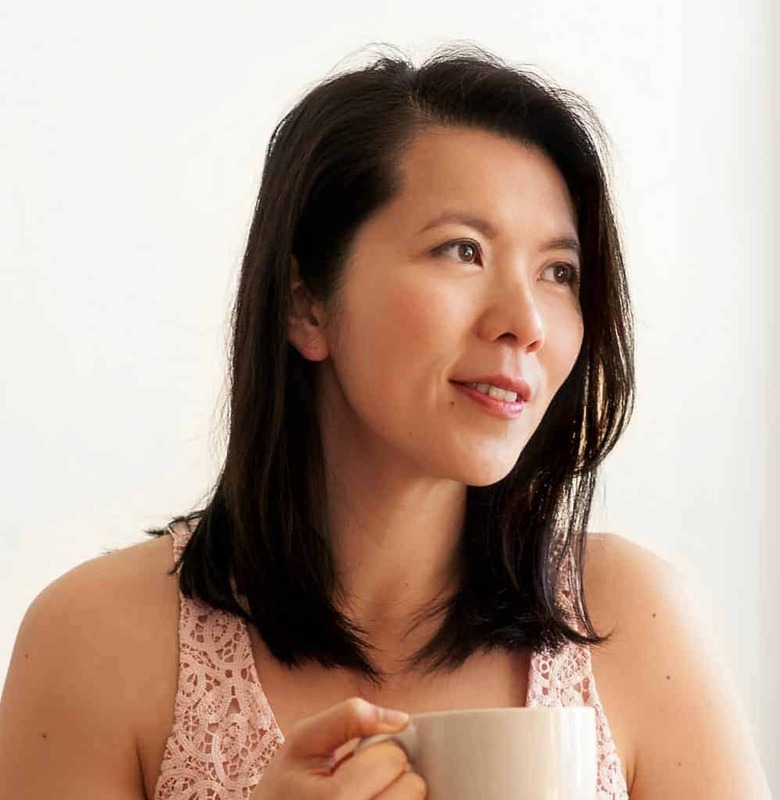 You took 2 of my favorite foods and mashed them together–Totally in love with this recipe! Fusion food at its very best!! 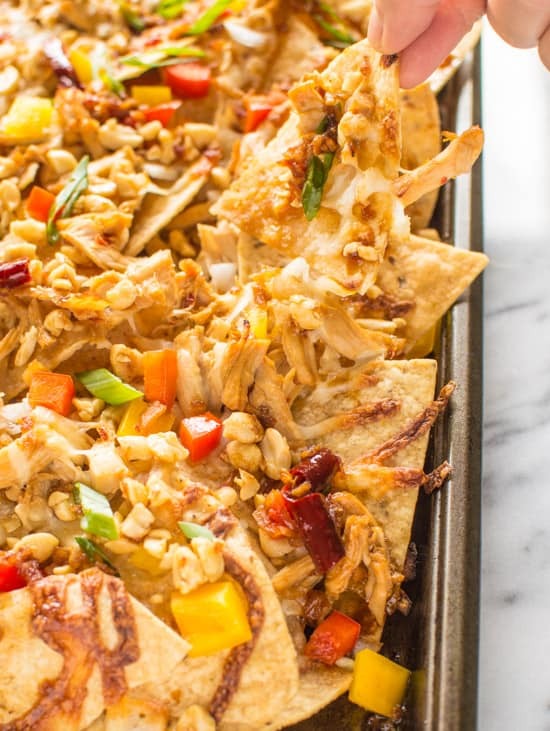 Everything about these nachos is perfect! In fact, even though I just ate breakfast, I would love to dig into these right now! Haha! I started eating these at 10am! No shame. I know what you mean! I had to tuck so many things into the crevices! Oh my gosh YES! I had some asian flavored nachos last year and I’ve been meaning to re-create them. But you’ve all ready done the work for me! Can’t wait to try these out, Lisa! Yay! Let me know how it turns out, Liz! What a fun idea! I’m so hungry after looking at these pictures!! Cool twist on nachos! Never heard of anything like this before!!! Yum! Love this creative dish! Two of my favorite foods combined into one. Perfect! Thanks, Elizabeth! My favorite comfort foods, too! 1) OMGTHESENACHOS!! I have a deep and abiding passion for developing new nacho twists and have even put together a business plan around an ethnic nacho truck but I would never have dreamed up something this creative. 2) Yes the day after Super Bowl Sunday should be a holiday! Lisa for President! An ethic nacho food truck?? Can I get in on that? Hehe, glad you think the day after Super Bowl should be a holiday, too! I love Kung Pao Chicken! What an incredibly creative and delicious idea to turn it into Nachos.. I love it! You, my friend, are a culinary genius. Seriously. I AM OBSESSED with kung pao chicken (especially the dirty, corner store kind) but with a hybrid nachos? I have no words. (Okay, I have alot but still). Thanks, Arman!! I don’t know what it is about hole-in-the-wall places, but they definitely can whip up some good dishes sometimes, like kung pao chicken! You? No words? Don’t believe it! Oh my this looks good, anything will chillies, peanuts and chicken is going to get my attention, cheers! 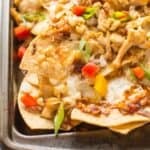 kung pao chicken nachos?! Lisa, this is seriously brilliant!!! Why didn’t I think of this!! love!! Love, love, love nachos and especially love this unique twist on them. Pinning for a future meal idea. Yum!!! These looks SO good! I have an at-home date weekend with the boyfriend coming up, and I think we MAY just have to make these for our movie night! Thanks, Ariana!! If you tried it out, let me know! For me, this is perfection. I have a great love of nachos and Chinese food so combining them is a winning combo! Sounds like a very interesting combination! I might try it with almonds- I can’t have peanuts. But can it really be Kung Pao without peanuts?? I say yes!! Almonds sound fantastic too! This is pure genius! I love this idea and can’t wait to try it out. Yummy! Thanks, Camille! Let me know if you do! 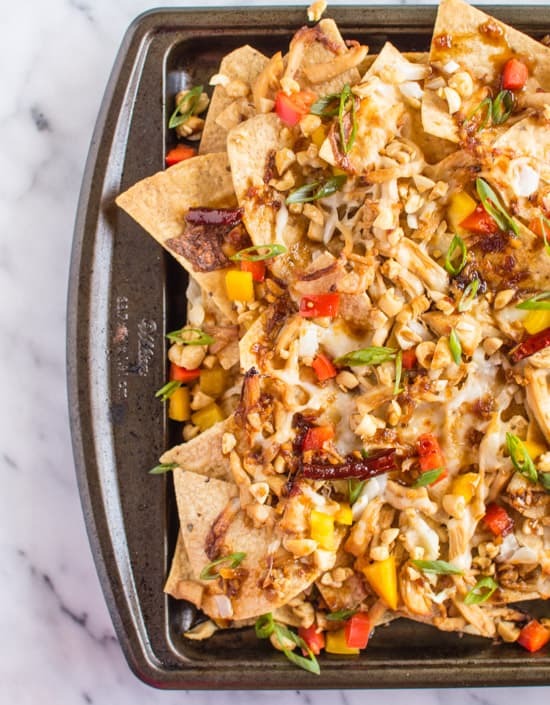 We love having nachos for dinner…this will be a great way to mix things up a bit! Thanks for sharing! When I had this while watching the super bowl, I definitely slipped into a food coma big time! 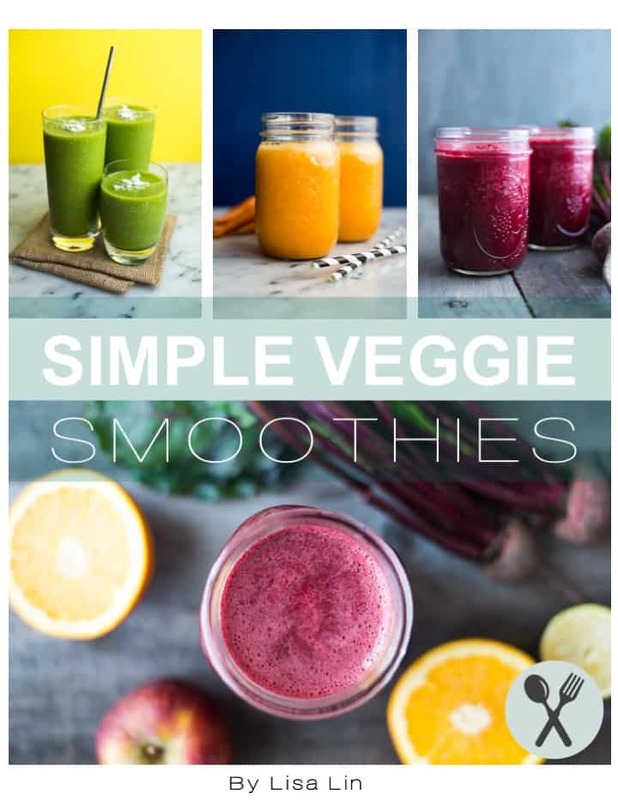 This is such a great recipe remix! Looks soooo yum.